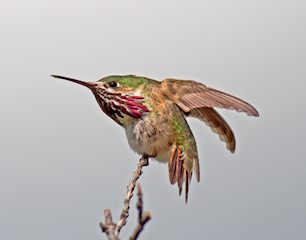 The Calliope hummingbird, (Stellula calliope), is the smallest breeding bird in North America. It is also the smallest little visitor north of Mexico except for a rare sighting of the Bumblebee hummer. He is also the smallest long-distance migrating bird in the world. MALE COLORING :The gorget of the male Calliope is a deep wine red or magenta color with white. He has a green back, with white, black and buff feathers. The usual dimorphic coloring applies to Calliopes where the male is much brighter and attractive. FEMALE COLORING The female has a throat of a pale rufous coloring with white and some bright green, cream, grey and black on the body. SIZE They are about 2 to 3 inches with a tiny wingspan of 4 inches. TAIL The tail is short and blunt. It travels from north Baja California to central British Columbia and to Wyoming, Montana and western Alberta. Most winter in southwest Mexico after staying elsewhere throughout spring and summer, but some occasionally winter along the gulf coast. They arrive to mate around springtime. They prefer to nest in pine cones in conifer trees, the perfect camouflage for their tiny nest cups. They also choose Apple and Alder trees and will use the same nest year after year. This little bird's numbers are decreasing due to habitat destruction, pesticides, invasive plants, diseases and natural disasters. Also, cross-breeding with similar hummers like the Costa's is reducing the gene pool and making tracking difficult. This is a very timid species except during breeding season when he becomes very territorial. While attracting a mate, he is seen doing a hovering type of ritual making buzzing noises and even flying in circles and loops. The Calliope is not a social bird, preferring to fly and live alone. He also likes to eat close to the ground, as his timidness and shyness make him prey to more aggressive hummers like Anna's and easy to chase away at feeders. When trying to attract the Calliope hummingbird to one's back yard, consider a sheltered covered area where they will feel more secure. They are an unusually hardy small bird and can be sighted in the states of Washington, California, Oregon, Idaho and Nevada.